Don't miss this machete BOGO! From the dense jungles of the Amazon basin to America's suburban backyards, the Gavilan Colombian Cane Machete makes quick work of thick brush, tall weeds, stout vines and wide branches. Like all Gavilan knives, it boasts a hefty blade forged from SAE 1074 high carbon steel blade - among the toughest and sharpest on the planet. Backed by a rock solid lifetime guarantee, the stalwart blade bears the iconic Gavilan De Incolma Colombia Eagle stamp - a long-trusted mark of authenticity and unrivaled quality. A handy hook for pulling on brush after it's been cut is built into the blade spine. At 21" overall, the Colombian Cane Machete is amply sized for any cutting job without being cumbersome and unwieldy. Its impeccable weight distribution and contoured hardwood handle afford an extraordinary balance and feel you won't find in any other machete at this price and beyond. 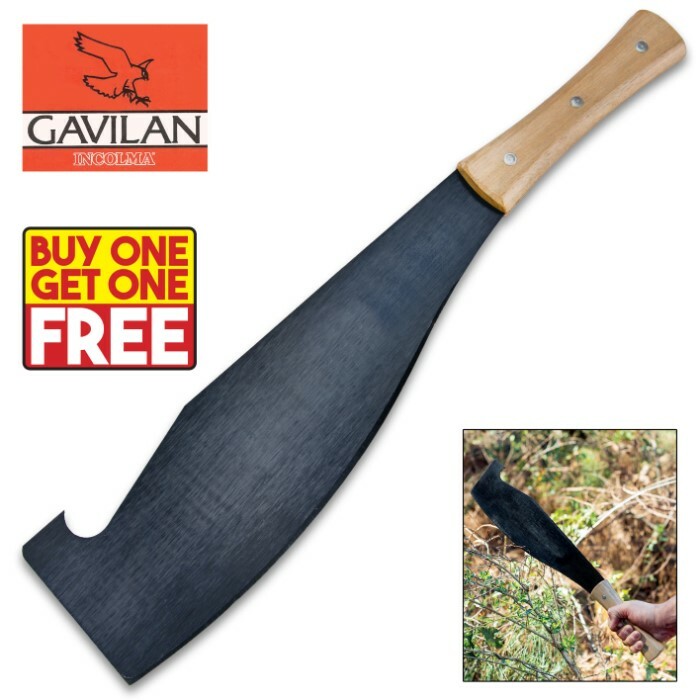 Gavilan's impressive-yet-affordable Colombian Cane Machete proves you don't always have to pay a fortune to get the best. Sheath sold separately. Get two of the machetes for the price of one! I got this as bogo w/free shipping! How can you go wrong? I sharpened the blade and tried it out on some wetland clearing. It is a true workhorse! Also, the blade will hold a great edge after its sharpened properly... I'm replacing the handle on one with a long piece of bamboo for areas over water to get a long reach. The powder coat will come off. No big deal. Just keep it oiled or paint it... Very nice deal. I recommend it for a great affordable yard tool. THANKS AGAIN BUDK!!! I have several Gavilan machetes but this is my fave. Gavilan uses recycled leaf-springs from cars to make these. Very strong and flexible. This one is wide enough to dig with and shovel hot coals. It's more of a multi tool. Can't beat the price either. Quite a bit thicker and longer and much heavier than the Tramontina cane knife I have. Sturdy. Powder coat flakes off, but no big deal. The blade has a nice bell-like ring when struck. Great bargain if you get a BOGO deal. Do yourself a favor and slightly blunt the tip of that wicked hook at the tip. I ordered 2 sets. 2 of the 4 had the powder coat bubble and peel off at the first use...... That being said.... These are the best bush whacking machetes I've ever seen. I will order more and have spray paint on hands to replace the coat. I will order more and have spray paint on hands to replace the coat. This cane machette is a really good buy. It's well made and the price is very good. When they came in I was a little skeptical. Looked cheaply made, the blade was pretty dull probably made from and old leaf spring but I wasent expecting a grade A machete. I had about an acre of small saplings and brush I wanted to clear out so I sharpened up the blade with a file and went to work. It surprisingly made easy work the entire time I was using it. From quarter inch thick vines, to 2-3 inch saplings. I only re-sharpened it once though out the day. The blade stayed firm, handle was mostly comfortable and stayed tight, the hook on the end was pretty useful for pulling vines. The only real issue was the black coating on the blade came off, but you can fix that easily. Overall I got way more value than I expected from a bogo machete off budk lol. If you're a guy who loves good deals on tools, or camping stuff I strongly recommend this. If you happen to get a bad one, it's only 10$ so who cares. Got 2 on the bogo. Very heafty. Seem durable. The edge will need to be cleaned up though, has a burr line running down one side of the edge.